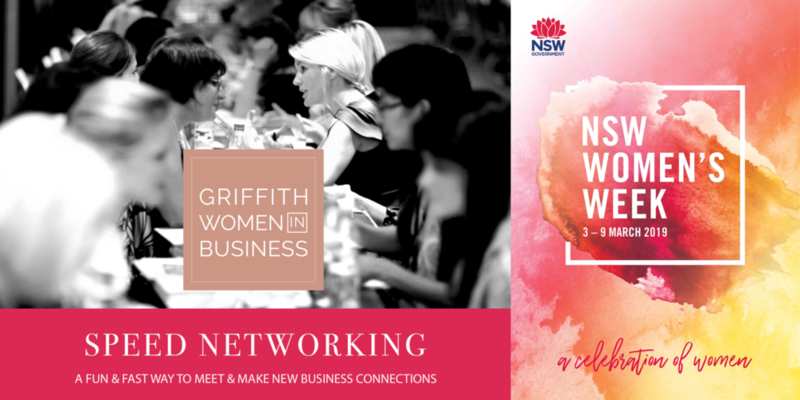 As part of the 2019 NSW Women's Week, Griffith Women in Business are excited to host their first 'Speed Networking' event. What is speed networking we hear you ask? Well it's basically a fun and fast way to meet and make new business connections. Why participate? Why not! It's such a great opportunity to expand your network and connect with other women in your region who you may never get the chance to otherwise meet. Cost includes a great range of warm and cold food platters plus a drink on arrival. Hosted by Naomi Stuart, Commonwealth Bank's Riverina Executive Manager and president of Wagga Wagga's Women in Business group. We’ve had a great first year with loads of highlights. Now it’s time to celebrate our first anniversary with a 'Members Only,’ Free event. We’ll provide the food and drinks - it’s our way of thanking you for your support throughout the year. We’ll start the evening with our AGM, and we promise to keep that formal part of the evening brief. Then, we’ll kick on with drinks, nibbles and festivities. We look forward to seeing you our last event for 2018 and celebrating with you! Get 5 Top Tips in 5 Minutes from our panel of experts! As part of Small Business Month, NSW Department of Industry has provided funding to Councils across NSW to help us celebrate our local small and medium-sized business community. 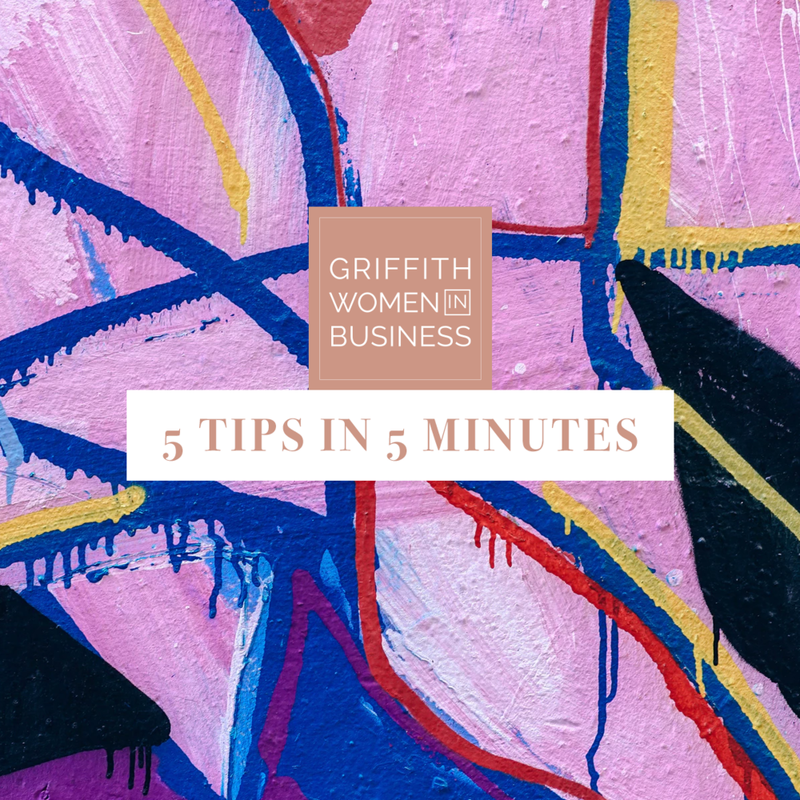 Griffith Women in Business along with Griffith City Council and Quest, Griffith are hosting 5 Tips in 5 Minutes where a panel of local experts will share their business tips in a relaxed question and answer style forum. 5 Tips in 5 Minutes will be held at The Quest Conference Room, Railway Street, Griffith commencing at 5:30 pm on Monday 29 October 2018. Topics covered will include Finance, Customer Service, Health & Wellbeing, Marketing and Networking. Join us for a relaxed, informative evening. Join us as Daizy Mann shares her experience and insights on the growing startup ecosystem, personal branding and resilience. Daizy is a former Wade High student, who now leads Deakin University’s innovation and entrepreneurship initiative SPARK Deakin which invests in ambitious entrepreneurs and fosters entrepreneurial thinking. At the age of 19 she was one of the youngest candidates for Australian Youth Ambassadors for Development (AYAD) program backed by the Department of Foreign Affairs and Trade, her work involved providing legal aid for refugees and asylum seekers and contributing to dialogue with the UNHCR regarding refugee status in Bangkok. She serves on the board of and is one of the youngest Directors of a publicly listed company that donates 60% of profits to the local community – Canterbury Community Bank and has Founded of Social Enterprise Collective (SeCo) and Zana Consulting in Tanzania connecting entrepreneurs to local expertise in Tanzania to set up businesses. She has championed gender equality in the Indian community through her ambassadorship of Pink Ladoo, being featured in Herald Sun and India Link. We are impressed - and think you will be too. Her energy is positively infectious. Enjoy a complimentary wine on arrival + canapes and share in Daizy's knowledge and journey with us. Exclusive and Limited Workshop. Learn specific strategies to open up creativity for designing the life you want. An evening with Ros Hemley presenting her key strategies to living life fully, sharing her steps to success. Enjoy a delicious breakfast and network with fellow GWIB members. Tickets are on sale now. Limited numbers so get in quick. If you're not already a member, join GWIB now. Business partnerships are now also open. Apply now. For over 20 ground-breaking years in the health and fitness industry Michelle has focused exclusively on breaking down the barriers that block our path to happier and healthier lives. Best known as Australia’s most influential personal trainer, Michelle mixes her tough love message with heartwarming compassion and has won the hearts and minds of Australian’s of all ages, weights and genders. We are delighted to announce the launch of our Griffith Women in Business network group. This event is for women who want to meet other like-minded women living and working in Griffith and surrounds. Come along and share your story, exchange ideas and network. Join us for delicious canapes and service from The Flowering Zucchini and wines from the Riverina Winemakers Association from 5:30 pm on Tuesday, 12 December at Bidgee Studio Gardens (Cnr Bridge Rd and Mackay Ave). We're looking to sign up some sassy, smart women as members and start building our program for 2018. There's no pressure to join on the night, however, we are providing six months bonus membership free!